A Citizen Scientist who goes by MVB paid a large amount of money for a real lab test on "fresh rainwater". He suspected that because of a dipping jet stream and the recent obvious atmospheric releases from Fukushima caught by "cam watchers" such as Majia and Nuchechen <sic> that he might get some hot rain. 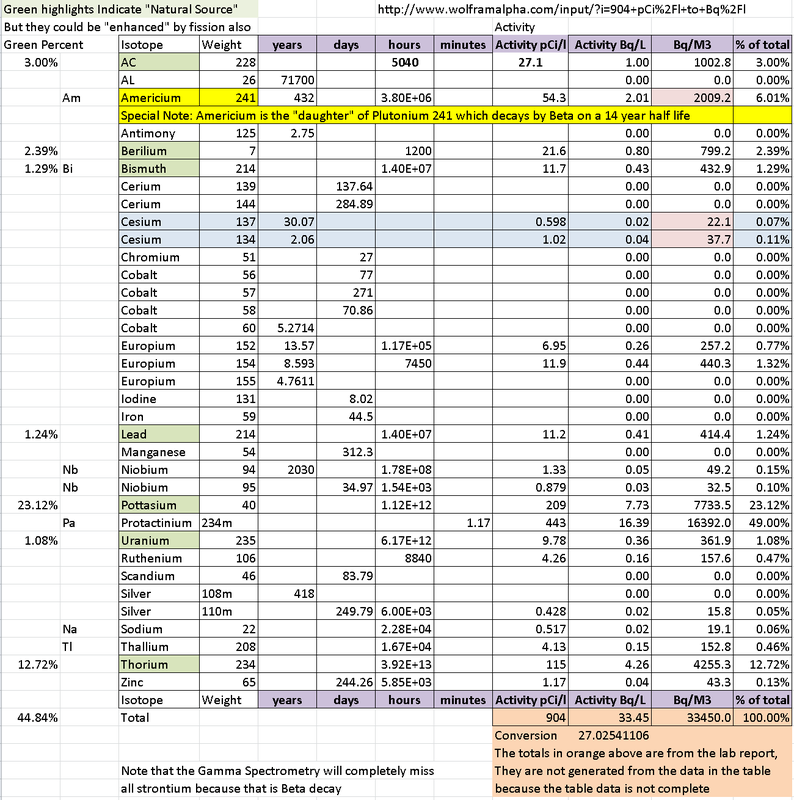 I have been analyzing MVBs gamma spec on rain water. I have been trying to wrap my brain around it and create an article, but I am just flipping around like a boneless chicken. What he found was 33,450 Bq per M3 water. Of substances that could be of natural origin (but supplemented by fission)that would be 45%. So 55% or more is from man-made radiation. 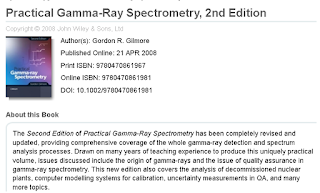 But only the gamma sources were detected, so isotopes that emit only in beta, such as strontium, tritium, plutonium 241 are not even part of the report. 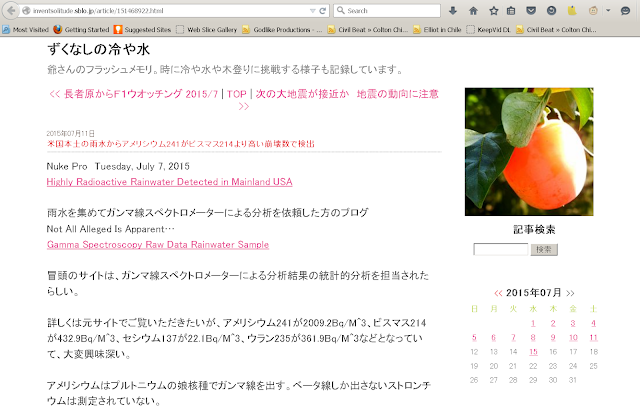 There is a large presence of Americium 241, it 6 percent of radiation. But that has a super long half life 3.8 million hours, so it doesn't emit that often, so there is A LOT of it. 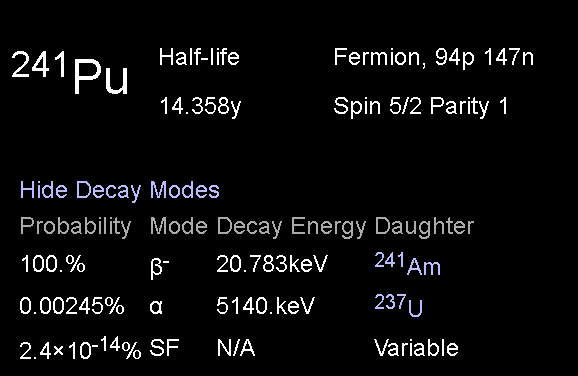 Americium 241 comes from a beta decay of Plutonium 241. So the plutonium was not detected because its beta decay. And there is A LOT of Americium. 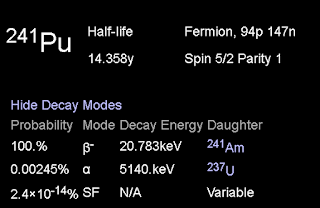 But PU 241 has a half life of 14 years, and Fukushima blew up 4 years ago, so not even 1/3 of 1/2 has transformed into Americium. But there is A LOT of Americium. I have made a spreadsheet that replicated some of the lab data. I wanted also to figure out what might be naturally occurring. I had previously analyzed the data for the CS134 to CS137 ratio which can function as a time stamp to see if they were from a recent release. The Cs was actually in pretty low proportions and the data showed more Cs 134 than Cs137 so there was no "proof" as to whether it was a recent release. I'll add more later, including the spreadsheet itself. Majia, the author of 2 great books on Fukushima related issues, enquired about my thoughts on what is actually happening. stock: Not sure, combination of factors. Continued fallout of uranium (as well as airborne uranium/radium decay schemes), plutonium, and Americium from Fuku prompt criticality "canon blasts" as well on ongoing fresh emissions carried by jet stream. Fallout especially concentrated during cloud to cloud lighting discharges. MVB was worried that because no individual result could be guaranteed by a radiation lab to be "correct" that we had to accept that none of the data was correct. I provided a "duck theory" response in the comment section and then elaborated on my train of thought in the screen capture of spreadsheet. 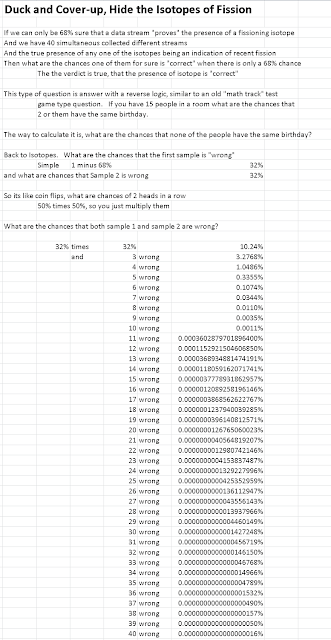 One can see that even if you only had 5 samples that could prove recent fission products, and you were only 68% sure about each one being correct (i.e. a 1 sigma level of confidence), then the chance that all 5 are wrong becomes vanishingly small. Thanks for the attempt. Interesting. Too bad you can’t really work with the amount data, as it is all <MDA and the margin of error is greater than the "measured", all you really can say is that the detections of specific decay energies indicates that 'SOME' of the corresponding radioisotopes were in that rainwater. The amount data can't be used for anything statistical; it's just not solid enough. Nevertheless, an interesting attempt to figure out if more can be derived from the data. Tx. If there's anything I learned from this is that Beta Spectroscopy (with low MDAs) is really what's called for. We need to be able to come to decision making capabilities with having far less than a 95% certainty on each of 40 items. 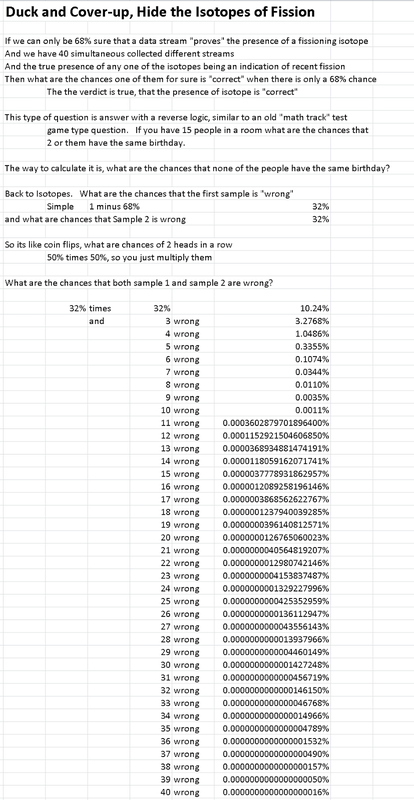 They are using a 2 sigma filter to say "are we really 95% sure that any individual result is for sure". When we have 40 of those filters and almost all point in the direction of yes, we really detected these other things that are only from fission, and some of them, only from recent fission, then it would be silly to think that we need a higher level of proof. I have a masters level background in probability and statistics, and I can tell you that when enough things quack like a duck and look like duck, you don't need to listen to a lab that needs more money for a longer test....you can already determine that it's duck. 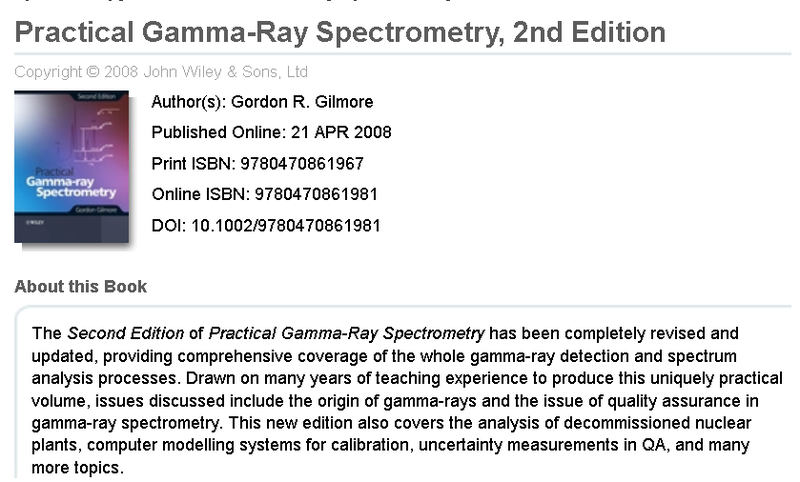 Although some say errors on gamma sampling are more of a poisson distribution. Detection of fission is non Poisson. Consult Feynman Y function (variance over mean). I've added, "An Attempt to Identify the ‘Unknown’-Flagged keV Decay Energies in the Lichen Sample Gammaspectroscopy"
One reason I'm skeptical of my initial "whoa, look, this is ALL in there!" is that the isotope lists for the lichen and the rainwater are the same, meaning that's the list of isotopes they look for. Some of the values are too low, lower than the uncertainty and below the critical level, so probably some of those need to be scrapped. Nevertheless, not all. Not impossible that there's some gems in the raw data, but I don't know enough yet to figure it out yet. All raw data is now on my blog, so scrutinize at will. Please drop me a comment if you spot something interesting, damning or unusual. PS: Not sure what constitutes "paid a large amount of money", but truth be told, I haven't even paid yet. Ha! (The leaked me the raw data pre-data release.) The pricing is $200/gamma spec, so $400 total. Not important, but I wasn't watching the cam watchers, by the way. I mean really wtf is passing for common sense these days?? LIES??? Im going to encourage you to be a competent citizen scientist. Can you please explain the reason there is no discernable 185 keV gamma peak in the rainwater? Do you know which isotope this energy spike belongs? 185 kev peak is not there Hangout also spits it out as well. I dont think I know it all. But I am certain I know more than you. Not all experts in nuclear are shills. Was Chuck Yeager a shill for the airlines? No. He flew for the pure passion of the technology. Learn the difference. Hafnium also spits out a less intense 185 keV gamma. You didnt know that Im sure. You are a paid nuclear shill troll because you deny fuku happened. How much more psychopathic and money hungry could a person possibly be? MVB has some new info today on Bobby1's blog. I am currently blocked from viewing his site directly. "Is it down for everyone, or just me?" reports that it is just me. I will also be setting up a real gamma scint lab this fall/winter and running samples and analysis.